It is said that dulce de leche first originated in Argentina when a young maid was preparing sweetened milk for her master, Juan Manuel De Rosas. When military and political figure Juan Lavalle arrived with a peace treaty, the maid became distracted and completely forgot about the milk. Eventually, she returned to the stove and found that the sweetened milk had turned into a caramel-brown paste. 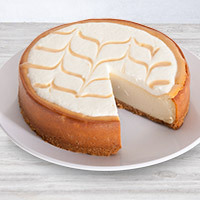 She still served it to her master Juan Manuel, who deemed it to be absolutely delicious, and thus created a dessert loved by all. 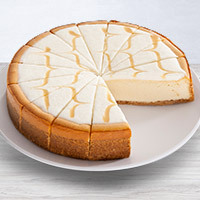 Our delicious Dulce De Leche Cheesecake is made of our smooth cheesecake that's topped with a coat of the rich milk cream that's been a tradition for centuries.